I read romance, mysteries, thrillers, action-adventure (um, Clive Cussler anyone? ), fantasy, science fiction … well, you get the picture. I read. On good days (when I am not recovering from eye surgery), I read a book a night. It is how I relax and clear my mind before going to bed. So, I read a lot of books. Every once in a while I read a book that blows me away, and then I have to read everything the author has written. 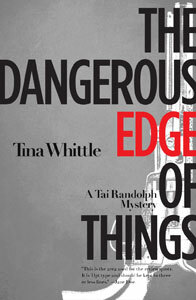 Once such author is Tina Whittle, who writes the Tai Randolph series for Poisoned Pen Press. Now, if you can’t tell from the name of the publishing company, Poisoned Pen is a small indie press that publishes mysteries. I have read other authors published by Poisoned Pen, and they publish excellent books. ~ by Monette Michaels on March 30, 2013.